Belshazzar the king held a great feast for a thousand of his nobles, and he was drinking wine in the presence of the thousand…he gave orders to bring the gold and silver vessels which Nebuchadnezzar his father had taken out of the temple which was in Jerusalem, in order that the king and his nobles…might drink from them. There were four kings between Nebuchadnezzar and Belshazzar. Three were assassinated and the fourth enthroned Belshazzar, who appears to be a descendant of Nebuchadnezzar (5:13). So there were some 13 years between Nebuchadnezzar and Belshazzar. Where was Daniel? 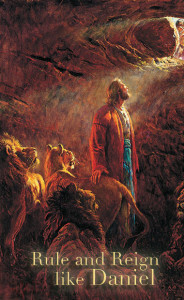 In quiet – oh the quiet of Daniel! – he goes about his business. By secret worship (which is surrender), he is always ready to be summoned and used. Daniel can be obscure, and yet he is also able to bear the spotlight. Neither is important, only God’s will and HIS transcendent reign. The great paradox of Daniel is that he is at the mercy, every moment, of these cruel heathen kings…yet he is untouchable (in another realm). He rules the kings who rule him. Kings come and kings go, while Daniel remains. He outlasts them, survives them and is needed by them. Again the story of the kings is irrelevant. Only God’s people are relevant to history. HIS story will always focus on them. The world is nothing to the kingdom!